Andros Town is the capital of the island, built on a peninsula that divides the sea in two, with the pedestrian crossing it leading to Unknown Sailor’s square. It ends up on the small island, on which is built the medieval Venetian castle, and the rocky island of the famous and unique Tourlitis Lighthouse. Two sandy beaches surround the town of Andros, the central beach of the capital Neimporio in the west and Paraporti in the east. 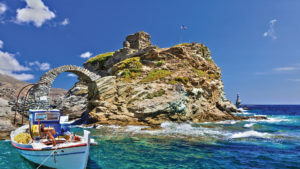 It is true that Andros Town does not look like a Cycladic capital at all, it is the homeland of renowned shipowners and captains and preserves its glory and its modest majesty. It’s unique. Beautiful neoclassical mansions and houses, paved streets, squares, picturesque alleys and beautiful churches. It has influential cultural and historical heritage with many museums and classical architecture. The entrance of the port of Andros Town dominates the lighthouse of Tourlitis, the only lighthouse in Europe built on a rock and the first automatic in Greece. You will see the remains of the 13th century Venetian castle and an arched stone bridge joining the Castle with Andros Town. In the square opposite from the castle rules the statue of the Unknown Sailor, in honour of all sailors who lost their lives in the sea. One of the most primary spiritual institutions is the Kairios Library housed in a 1919 mansion. The capital of Andros is full of culture. Visit the Archaeological Museum, the Museum of Contemporary Art and the Kydonieos Foundation. Beautiful is also the religious monuments. The church of Theoskepasti, protector of the island. The Virgin Mary church, Panagia Palatiani, the metropolitan church of St. George and Agia Thalassini on a rock by the sea. Messaria is a large village just before Andros Town. There you will find the Lorentzos-Kairis Tower, built in 1760, the 12th-century Byzantine temple of Taxiarchis and the stone bridge of the Stoixiomenis that connected Messaria with the village of Fallika. Pitrofos, a mountain settlement at an altitude of 350 meters, appears after the Stavropeda area on the southern hill of Mount Petalos. It has abundant vegetation, scattered springs and the remarkable Olive Museum of the Cyclades. Menites is one of the most beautiful villages near Andros Town. Water and vegetation are the dominant elements of the settlement, built between walnuts and plane trees. The waters run from the mouths of marble lions and the trenches next to the streets that water the fields. 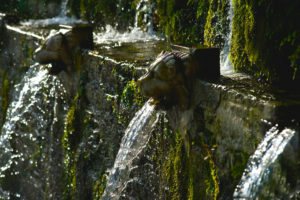 The name of the village draws its origin from the Mainades the nymphs of god Dionysus. After the Menites ascending the road to Andros Town, there are the settlements of Strapourgies, Mesathouri and Ypsilu. Slightly lower on the slope of the mountain is Lamyra village. The houses are spread out amongst trees and gardens with flowers and citrus trees. The village of Apoikia is built on a green slope overlooking the sea and Stenies. 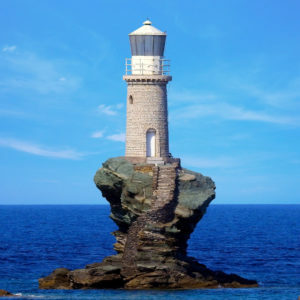 It is relatively large and is about 6 km away from Andros Town. The water apart from being dominant is also healing with the source of Sariza being one of the village’s sights. Pithara is a place where water forms a waterfall and the Monastery of St. Marina is in a short distance. In Katakalaioi, above Apoikia, you can enjoy a magnificent view of the sea and Andros Town. Below Apoikia you will find Stenies, a large captain’s village, with magnificent mansions, towers and houses with flowers and farms. 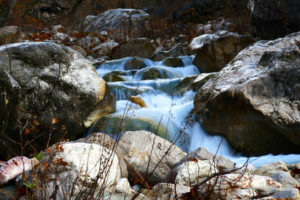 Below Stenies is the beautiful river that expands to Gialia next to Piso Gialia Beach. Vourkoti is the mountainous village of Andros at an altitude of 620 meters. Livadia village lies at the base of Gerakonas Mountain, a vast valley crossed by the Great River that flows into Paraporti Beach. Vrachnos or Vrachno is a village perched on the slope of Mount Gerakonas, at an altitude of 220 m. From this settlement, you can see the panoramic view of the valley from Menites to Andros Town. 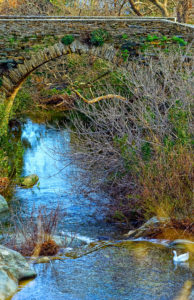 Opposite Messaria and towards the valley of the river is the Aladinou village, with the old stone bridge. There is also the cave of Aladinou “Foros”. Close to it, Fallika is a small picturesque village at an altitude of 240 meters below the Panachrantou Monastery. It has a wonderful view of the valley to the sea, and the settlements of Koureli and Sassa are very close.